The Hispanic Association of Colleges and Universities (HACU) welcomed its 2018 fall interns with an orientation on August 27, 2018, for college students serving internships in the Washington, D.C., metro area and other locations throughout the country. 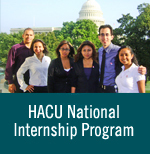 Over 130 students from colleges and universities across the country are among those who are participating in HACU’s National Internship Program. The fall program offers paid internship opportunities for students to gain valuable experience at federal agencies in Washington, D.C., or at field offices across the nation. More than half of the students will be working in the Washington, D.C., metro area and others will be at field locations nationwide. The internship dates are Aug. 23 through Dec. 7, 2018, for a total of 15 weeks. Some of the agencies sponsoring interns this fall include: Library of Congress (LOC); Substance Abuse and Mental Health Services Administration (SAMHSA); and U.S. Department of Agriculture (USDA). There is still an opportunity for students to apply for a spring internship that runs from Jan. 9 - Apr. 6. The application deadline for the spring session is October 26, 2018. Information about eligibility and online application is available here. College students participating in HACU's National Internship Program serving in the DC area participate in orientation on August 27, 2018. Among those participating in fall internship session are college students from the following institutions. Click here for a list of students.